We received a call on our 800 number from Ronda. She was interested in the idea of having a Sticks table made but didn’t really see anything that met her exactly needs. Ronda was looking at both Sticks Desks & Sticks Sofa Tables because she needed a table that would be used as a Sofa Table behind a couch but also planned to sit at the table and use it as a desk when needed. Most of the Sofa Tables had shelves below that would make it impossible to sit and most were not built with a completely flat top she’d need for a desk surface. Most of the desks were too large and didn’t have that long narrow profile she was looking for. We’ll she came to the right place! It didn’t take long to explain that these issues would be no problem. We’d take the standard Sticks Sofa Table and make some changes to how it was built in order to accommodate exactly what she needed. First, we’d have it built with a flat top. Then, we’d have it made without the shelf underneath and lastly we’d add some drawers to the apron to make it more function as a desk. 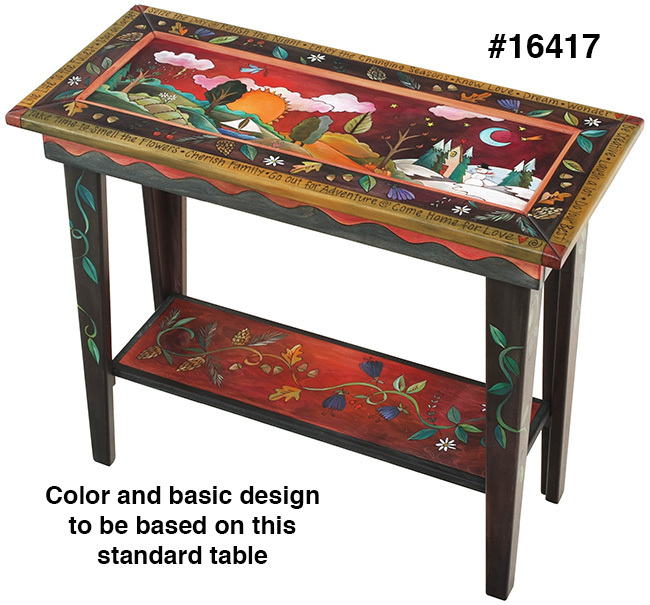 Once we had the structure of the table all set, our design staff worked with Ronda to zero in on the colors and design. As always, we had Ronda first start by looking through our Sticks Sofa Table Catalog to hone in on what she liked and maybe didn’t like so much. Ronda zeroed in on a landscape design she liked. After listening to what Ronda had to say, our design staff keyed in on the idea that her family had spent many years in Florida but now reside in Utah. Instead of including a generic landscape, we encouraged her to make it personal. Why not have the landscape transition from a Florida feel to a Utah feel? She loved it! This got the creative juices flowing. Ronda even decided to make her special dogs a part of the design. We got to work putting the order details together for the artist. 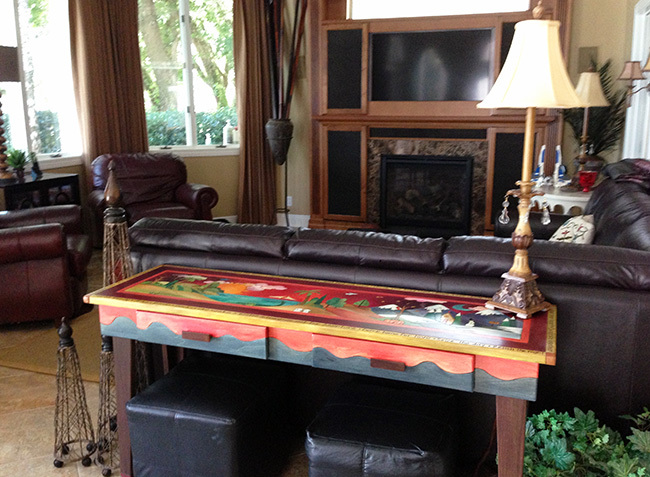 Take a look at what we communicated to the artist and how her awesome table turned out. All the colors are good here. She wants to maintain the dark brown legs and the grey color on the apron wave, the same word border color etc. Remove design in floral border (surrounding landscape), but leave the plain border in it’s place. In other words, we want the plain border separating the word border and the landscape, leaving out the design currently in that border. Use the landscape shown for overall 4 seasons reference. But, change it up a bit to transition from FL (on left) to Utah on right – they moved from one to the other. Add a small plane flying in the sky. Husband is a pilot. Include two small white fluffy Maltese dogs in the landscape somewhere. They should be located together. Bottom of the legs like small stripes or something just to anchor the legs since they’ll be so plain. Rest of words are artist choice using standard sayings like, Go out for adventure come home for love – Seize the day, relish the night – Live life to the fullest, etc. 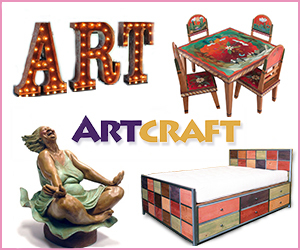 Artcraft’s Summer Sale is HERE!